Update: Week 3 winner announced! Congratulations to Eddie Love @EddieLove44! Update: Week 2 winner announced! The winner of the second copy of John Wayne: The Life and Legend is….. (drumroll)…. Update: Week 1 winner announced! Week 1: Starting with the publication of this post on March 17 through Friday, March 21 – leave a comment below stating which is your favorite John Wayne movie. After conducting the tried and true picking a name out of a hat method, I’m happy to report that the winner of John Wayne: The Life and Legend is Michael aka @Le0pard13! A reminder to everyone else that giveaways for additional copies will follow in the coming weeks. The second week’s giveaway starts Monday via Twitter. Thanks to everyone who participated! Update: Since I released the original announcement for this giveaway, Simon and Schuster has published the official trailer for John Wayne: The Life and Legend. It’s a great piece, which features Scott Eyman discussing how the biography of the screen legend came to be. Take a look at it here. Hot off the presses is acclaimed biographer, Scott Eyman‘s latest book, John Wayne: The Life and Legend, an expansive work that covers the life and career of one of the silver screen’s most admired figures. I just finished reading it and couldn’t wait to share my thoughts. But first I must extend a thank you to Stephen Bedford of Simon & Schuster for not only sending me a review copy of the book, but for offering additional copies to give away on Once Upon a Screen. More on that in a moment. John Wayne: The Life and Legend tells the story of Duke Wayne from childhood through the stages of his career, which kicked into high gear (after eighty film appearances) with the ever-fascinating introduction shot in John Ford’s Stagecoach in 1939. Eyman recounts Wayne’s life from his birth in Winterset, Iowa through his rise to stardom and on to the bigger-than-life image that still packs a punch today. An image, I might add that was both carefully crafted and inevitable based on the many interviews Eyman was able to draw upon to tell this story, including an interview with John Wayne himself. it occurred to me that those are also the qualities that my two favorite John Wayne film roles have – Sean Thornton in John Ford’s The Quiet Man (1952) and John T. Chance in Howard Hawks’ Rio Bravo (1959) – both discussed at length in John Wayne: The Life and Legend. In any case, this latest book by Scott Eyman is a compelling read. With little time at hand I could barely put it down. I suspect I’ll be referring back to it often as a reference tool too. It’s a fascinating journey one must take to become a legend. Week 2: From Monday, March 24 through Friday, March 28 – I will share this announcement on Twitter, @CitizenScreen and anyone interested will need to RT and in 140 characters or less comment on his/her favorite John Wayne role. 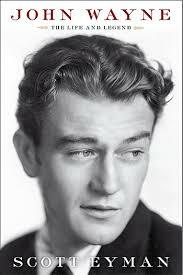 Week 3: From Monday, March 31 through Friday, April 4 – I will post an announcement on my Facebook page, Citizen Screen on which anyone interested need only “like” that announcement and comment on which is his/her favorite John Wayne co-star. Week 4: I will post an announcement on my Tumblr page, Citizen Screen on which anyone interested need only reblog the announcement and comment on which is his/her favorite John Wayne moment on film. You can enter as many times as you like. Each week’s winners will be chosen at random from all those that participate based on the details above. I will announce each week’s winner on this post and share it on the other social media platforms mentioned above. If the winner turns out to be you, please be sure to contact me within a couple of days of that announcement by sending me your mailing address via email to: citizenscreenclassics@gmail.com I will then forward that information to Stephen at Simon & Schuster so you can get your book as quickly as possible. 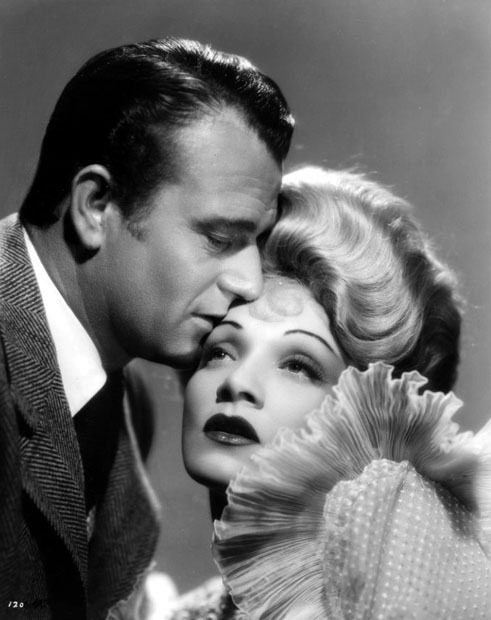 Before I go – I’d be remiss not to let you know that John Wayne is the Star of the Month for April on Turner Classic Movies (TCM). It’s no coincidence that the network should choose a man to whom “no one else could be compared,” according to Scott Eyman, as the Star of the Month during the month in which it celebrates its 20th anniversary. And, don’t be surprised if Mr. Eyman makes an appearance or two to discuss Duke Wayne, his life and legend. Be prepared and clear your DVRs now. The Quiet Man and Red River are my two favorite Duke movies. YAY! Thanks, John. Red River is up there for me too and The Quiet Man is my absolute favorite. His other westerns are better known (The Searchers, Rio Bravo, Red River), but my favorite John Wayne film is probably The Man Who Shot Liberty Valance. Sadly, I do not qualify, which is probably for the best because I can’t choose just one John Wayne movie! This shouldn’t surprise you in the least. THE QUIET MAN- hands down!! Rio Bravo – much as I love The Searchers this one gets me every time. It’s tough to come up with my favorite, since I love the majority of his films. But, I think I love “El Dorado” the most, with “Donovan’s Reef” coming up a close second. Having almost reached the ripe old age of 70, it’s a pleasure to say that I have viewed most ( if not all of the Duke’s films). I’ve even had the chance to be a friend of a woman who was a New York City model in the 50’/60’s who had made a “connection” with the Duke. Anyway, favorite film, The Seachers, mainly because I grew up with the memory of seeing it in the theater and also the enjoying of each repeated viewing. The book, “The Seachers:The Making of an American Legend” by Glenn Frankel is outstanding and makes watching the film much more enjoyable. Of course, all of the films mentioned here are worthy, The Quiet Man, Red River, Hondo (another favorite, seen at the theater in 3D), etc…. Looking forward to reading this new history of a special person. She Wore a Yellow ribbon and The Quiet Man. Picking a favorite is hard, but given that it is the day after St. Patrick’s Day, I’m going with “The Quiet Man”, my favorite non-western John Wayne movie. I have to say my favorite John Wayne movie is, The Alamo! Tough to decide, but I like him in Without Reservations, with Claudette Colbert and Don Defore. He’s just so silly in that film and very different from his normal Western or Military roles. Going to have to go with Red River too. Maybe not his best role, but overall best film. 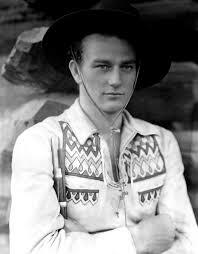 I think my favorite John Wayne movies at this moment are STAGECOACH and RIO BRAVO. Oh, and THE SEARCHERS. For sentimental reasons, ‘The Quiet Man’ and ‘Hatari!’, but also love all his ‘Rio’ movies. In fact, there should a river named after him for every western fan to be baptized in. I don’t see a lot of John Wayne movies, but my mailman is here and he’s a very big Duke fan. His favorite? The Quiet Man. Which I haven’t heard of. Ugh. The 1956 film, The Searchers, is not only my favorite John Wayne movie, but my favorite movie directed by John Ford. Great web site! Keep up the good work! Can I have two? “Rio Bravo” and “The Man Who Shot Liberty Vallance”. I can’t help loving McClintock. Just Saw ROOSTER COGBURN other day & REALLY. LOVED the Rapport W/ Hepburn! I felt I really liked him more than I had in other movies! THANK YOU to all who participated! The winner will be chosen at random and announced today. I’m glad Rio Bravo got a few nods and The Quiet Man, of course. Also glad to see a variety of choices. I was expecting The Searchers to be the across-the-board winner. I’m sticking W/Rooster COGBURN as my Favorite! A Tough guy Who’s Un-Toughed by Kate or at least M at he’d! !